This page is dedicated to answering some common questions regarding my Post Shaders. Try to email me only if your question is not answered here. HELP, how do i use this ?! Go to the utilities Panel and press the Configure Button Sets button. 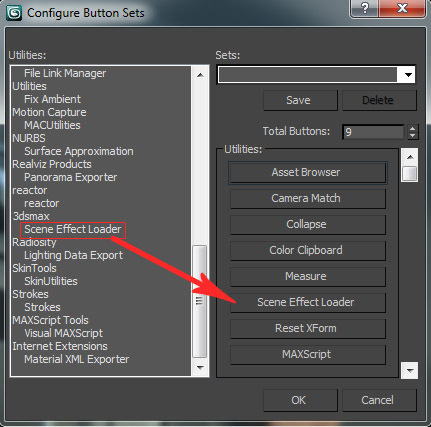 In the Configure Button Sets window, scroll down until you find the “Scene Effect Loader”. Drag it onto on of the buttons on the right. I replaced some useless button I never touch. 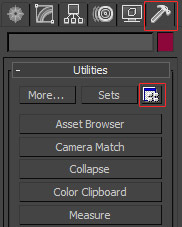 After closing the Button Sets window, press the new Scene Effect Loader button to open the interface. Use the Load Effect button to load the effect files you want to use. The order in which you load them does not matter. Check “Scene Effects” to enable or disable all effects. There are several possible reasons for the Scene Effect loader not to work. Double check if you followed the previous steps correctly. Make sure you meet all requirements. An ATi X700 graphics card might not work properly. If you have a recent GeForce card (8 series and higher), you should be safe. Don’t set your Max to any other viewport mode than DirectX9. DirectX10 is not better, do not use it. It actually has a lot more compatibility issues. 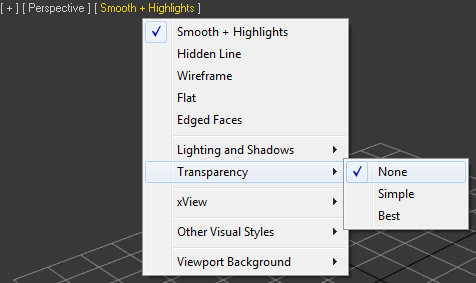 In Max 2010 and 2011, you might have to change the viewports’ Transparency settings. “None” tends to work better, strangely. In Max 2010 and 2011, Post-Shaders don’t play nice with viewport Ambient Occlusion (SSAO). You’ll see only the AO, or weird splotches or other artifacts. I can’t help this, so turn off AO, or see if the transparency setting has any effect. If the shaders seem to behave strangely in Max 2010 64bit, there might be a problem due to the Max 2011 trial. If you have installed the trial, your shaders might stop working in 64bit Max 2010. Autodesk might fix this. In the meatime, use 32bit Max. How do I use the viewport grab script? It does nothing when i run it! It’s a macroscript. that means you run it once and it defines an action that you can bind to a hotkey or custom button. Go to Customize > Customize User Interface. In the “Tools” Category you can find the entry created by the script, it is called “Grab Viewport”, without the ellipsis (… three dots) behind it. I recommend adding it to a custom toolbar to which you can add buttons for other usefull scripts. My Anti-Aliasing stops working when I turn on the Scene Effects! That’s normal. With DirectX9 and current realtime rendering, it’s not possible to have AA on a rendertarget, which is what Post Shaders rely heavily on. But this isn’t really a problem, just use the HiRes GrabViewport script and capture at extreme resolutions. If you scale these down, you get perfect AA. Why don’t you make Depth of Field (DOF) ? That’s technically not possible. I have not figured out a way to access the Z-depth buffer in 3DS Max yet, which is needed for DOF. By default, applications don’t allow access to the Z-buffer while rendering. You could work around this by creating custom rendering code that creates your own Z-Buffer rendertarget, but this is not possible in 3DS Max. There are a lot more limitations in Max than there are in games, but if you have an idea for a post shader, i don’t mind hearing it. Just try thinking if it would be possible to do in Photoshop on an image without any custom brushing. If it is, chance is it might work as a shader.